(RALEIGH, NC) – As multi-platinum selling and GRAMMY® winning group Casting Crowns prepares for this week’s release of a new studio album, “Only Jesus” (Nov. 16), the group announces the Only Jesus Tour, a 37-city spring arena tour run featuring fellow Grammy winner Zach Williams and Austin French. The tour kicks off Feb. 21, in Richmond, Va., and travels to major markets in New Jersey, Massachusetts, Maine, New York, North Carolina, Pennsylvania, Indiana, Kentucky, Mississippi, Michigan, Illinois, Missouri, Georgia, Florida and more before wrapping up on May 4, in College Station, Texas. Casting Crowns will bring the Only Jesus Tour to PNC Arena in Raleigh on April 19, 2019. Tickets will go on sale this week, with an early pre-sale campaign beginning at 10 a.m. local time Wednesday, Nov. 14, and running through 10 p.m. on Thursday, Nov. 15. The public on-sale will begin at 10 a.m. local time Friday, Nov. 16. Several exclusive VIP Fan Experience packages are available featuring options such as front row or premium seating, a pre-show jam session/Q&A with Casting Crowns, group photo opportunities, merchandise, signed tour poster and more. For ticket details, visit www.CastingCrowns.com/tour. Presented by Compassion International, the Only Jesus Tour will support Casting Crowns’ new studio album, “Only Jesus,” releasing this Friday. Over the past few weeks leading up to the street date, the band has released six of the album’s tracks early, including the title cut and first radio single, “Only Jesus,” which is one of the fastest charting songs of 2018 and already a Top 10 smash. 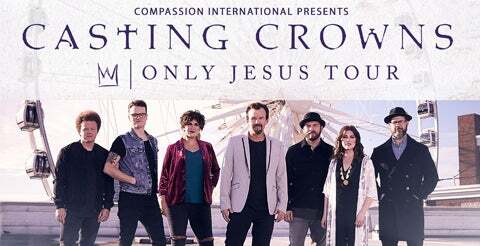 “Only Jesus” gives Casting Crowns their 26th Top 10 song on the Hot Christian Songs chart, the most by any group.